Our top 10 whiskies under $100. If you’re just getting into trying new whiskies, or you’re a seasoned whisky drinker, you know finding great quality whisky can be expensive. But if you know what you’re looking for, you can find some exceptional whiskies that you will remember forever. Below we have put together a list of our top 10 favorite whiskies you can find for under the $100 price point. We included a variety of all different kinds of whiskies from all different regions of Scotland and one from Japan. We hope you love them and look forward to hearing about your experience! Rich Pedro Ximénez Sherry Oaks dominates this whisky palette. In the best way possible. We love a good Spanish oloroso sherry, but sometimes the distinctive freshness you find with the PX is a refreshing mix up. This is perfect example of an excellent 12-year aged whisky done right, with a blend of PX casks and Olorosso sherry that create big flavor, and a warm delightful finish. You’ll be hard pressed to find someone who doesn’t enjoy a dram from Balvenie. All of their whiskies are carry a distinct character and easy drinkability. The 14 year Caribbean cask is such a fun whisky. After its time in oak it’s transferred to Caribbean rum casks that impart a playful sweetness that is addicting. One sip of this whisky, and you’ll be a Balvenie fan for life. Unique is the word I’d use to describe this whisky. This whisky is the perfect example of a “bang for you buck” whisky. We think it is up there with one of the best 14- year aged whiskies you can buy. It has a vibrant feel to it, coupled with a bit of citrus and peat, rounded out with spice and a salty, fruity body. The finish is unexpectedly long and delicious. A touch of water really opens the character of this whisky. You may not think to grab this with the plethora of options, but it is absolutely delicious. This whisky is not for the faint of heart! I remember the first time I tried this whisky, it was so peaty and smoky I almost couldn’t drink it. But after the initial shock of something radically different than what your palette is used to, you begin to crave the warm smoky, woody notes this tremendous whisky offers. And after some more sips you being to taste there is actually some fruitiness and some lovely sweetness, and what you thought was this big blast of smoke, is actually this wonderfully balanced powerhouse of flavor. There is not another whisky made quite like this. Let us introduce one of the most floral, and fruity 18- year olds you will meet. 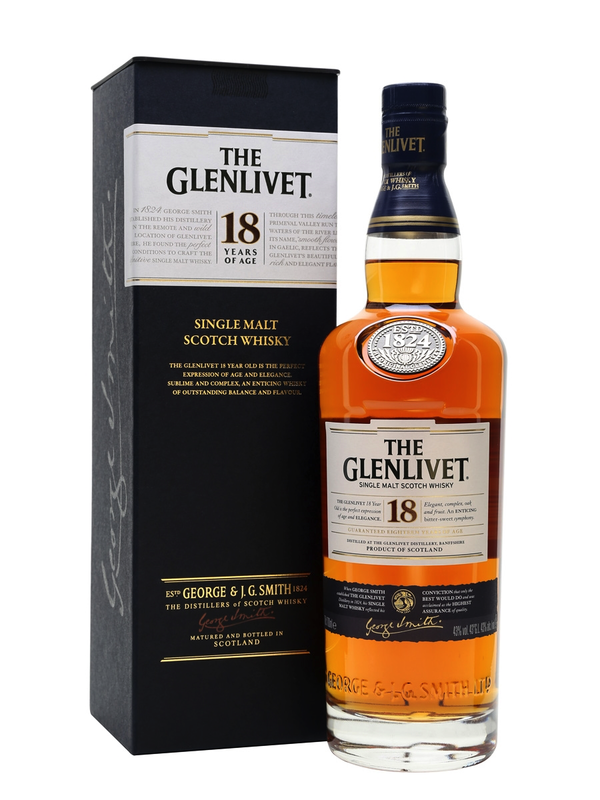 The Livet 18 has a classic whisky feel to it. The 18 years of this spirit are spent in a variety of barrels. First and second fill American and European Oak casks marry to create a very distinctive flavor profile. Fruity, Nutty, Rich, buttery goodness. Go grab yourself a bottle. The Oban. Everyone’s reliable “go to” dram. It has everything you want in a whisky, a welcoming flavor profile, it has a little smoke, it has body, it has balance; we have yet to meet someone who doesn’t like Oban 14. When you drink this whisky you immediately get sweetness and a very balanced tasting of the sweet caramel fruits, paired with an almost peppery smoke. Oban is also one of the oldest distilleries in Scotland so you are guaranteed to be drinking one with a profound history. Welcome to an incredibly easy drinking whisky. The Glenfiddich 15 is smooth but has a nice 'umph' behind it. This whisky will not explode with flavor in your mouth, but the flavors you get will be rich, refined, and downright delicious. The profile is loaded with spice and stewed apples, toffee, honey and oak. A luxurious feel for a beyond reasonable price! Pronounced ‘Oog-a-dal’, it’s a special vatting that marries Ardbeg’s traditional deep, smoky notes with luscious, raisiny tones of old ex-Sherry casks. Ardbeg Uigeadail was voted by the 120,000+ strong Ardbeg Committee as their favourite Ardbeg. Our favorite 10-year aged whisky. It’s big. It packs a punch, and is just loaded with flavor. It’s a perfect balance of youth, smoke, sweet, and citrus. The peat is wonderfully rich and nutty which distinguishes this 10-year from Campbeltown from other peated whiskies you’ve had. This whisky is such a powerhouse and an absolutely top dram. Pick one up and you’ll get it instantly. At the top of our list is the Hakushu 12. Here at Dram & Oak, not only is this our favorite whisky under $100, it is also our favorite 12-year aged whisky in the world. Truly one of the most unique whiskies you will have the pleasure of trying. This whisky has layers amongst layers of citrus and peat that lingers and transforms throughout your sip in a remarkable fashion. The peat is unlike traditional Islay peat, as the whisky ages in the forest of Japan. Therefore the salinity is non-existent and you get a remarkable balance of citrus and earthy qualities. A truly remarkable and underrated whisky. Enjoy before it is discontinued. Kanpai!